A Risaldar in the 30th Lancers (Gordon's Horse) who was born in the village of Rasulpur in the district of Amritsar, East Punjab. He saw action in France and Mesopotamia and survived to write his memoirs in the 1950s. His life has been researched by his grandson, Citizen Historian Raghbir Singh Bath. Harnam Singh was born in the village of Rasulpur in the District of Amritsar. Hailing from an old military, land-owning family, he joined the 30th Lancers as a Sowar in 1913, a year before the Great War broke out. Harnam Singh saw action, initially in France and then in Mesopotamia. He served as the squadron's writer. Maybe as a result of this professional duty, he wrote his memoirs in the 1950s. Written in Punjabi, they document his wartime experiences. The people of Europe are very fair-skinned because in their previous lives they prayed and meditated so much. The cold atmospheres and climates of those countries mean that their skin colour will never darken. They had never seen dark-skinned people before. They thought everyone in the world was white like them. When we disembarked and mounted our horses, we headed off through the markets to our billets. Thousands of men, women and children were in the streets and on the roofs of the houses waving white handkerchiefs. They were saying something that we didn't understand at the time. We later learnt that they were saying 'bonju' [bonjour], which is like our 'sat sri akal' [Sikh battle cry also used as a greeting]. A large factory was made available to us as a camp. It was called FACTORY ON THE RUE DE TOULON. The people of that country treated us with a great deal of love and showed us much affection. They wished to speak with us but we couldn't understand them nor they us. They gave us many gifts. When they met us they would give sweets, chocolates and cigarettes. They shook our hands and felt happy speaking with us. A number of innocent girls from well-to-do families would happily shake our hands. But several of these deceptive Hindustani tricksters deliberately squeezed their poor hands too tightly and shook them with such force that they pulled their shoulders. Those poor ones saw what was happening and soon stopped offering to shake our hands. Seeing us Sikhs they [the French] probably thought that we had been away from our homes for such a long time that we had not had an opportunity to get our beards shaved. Consequently, when they met a Sikh they would sympathetically offer to shave him. When they came to know that these were Sikhs and they do not cut their hair and beards, they were amazed. Harnam Singh survived the war. He retired at the rank of Jemadar in 1939 after 26 years of continuous service. His last four years were as Jemadar Quartermaster. By the time of retirement, his regiment had become the 8th King George's Own Light Cavalry (due to an amalgamation of the 30th Lancers with the 26th King George's Own Light Cavalry in 1921). 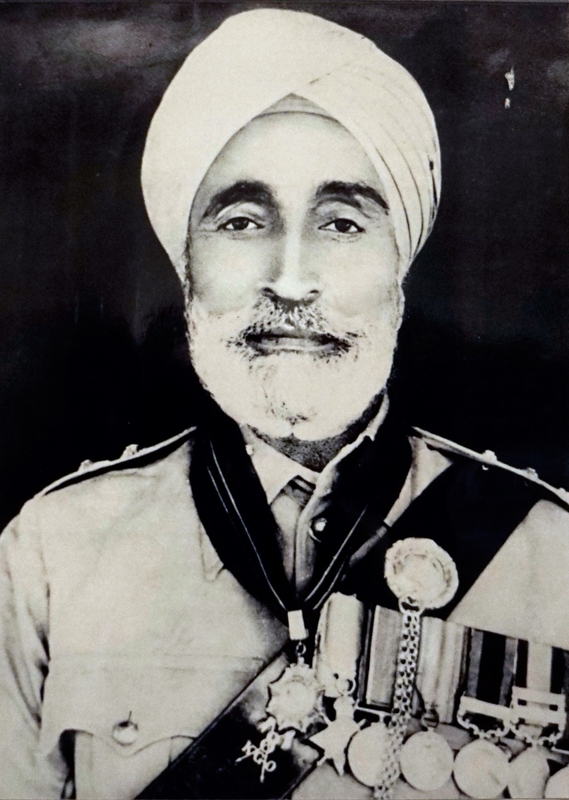 His regiment's lieutenant-colonel wrote in a letter of recommendation dated Kohat, 2 May 1939 that Harnam Singh was 'most trustworthy, reliable and hard working'. The officer continued: He is still young and active and has been unlucky not to have been promoted Risaldar [a senior cavalry rank] for which he is quite fit'. It would seem that his retirement didn't last for too long. With the outbreak of World War Two he was re-employed by the military. He gained a promotion to Risaldar and went on to serve as Quarter Master Risaldar at the Indian Armour Corps, Recruit Training Centre, Lucknow, from 1940-45. Some time in the 1940s he was awarded the Order of British India (OBI), 1st Class. The OBI was an order of merit awarded for distinguished service on a particular campaign, but was also often awarded to officers for between 20 and 30 years service. It was awarded in two classes: first and second class. The recipients of the second class were entitled to the title 'Bahadur' (hero) and recipients of the first class were entitled to use the title 'Sardar Bahadur' (heroic leader). Harnam Singh was also awarded the rank of honorary lieutenant. He wrote his memoirs, which contain details of his military career, in the 1950s. His unpublished manuscripts are preserved by his grandson, Citizen Historian Raghbir Singh Bath. Harnam Singh's family surname is Bath.